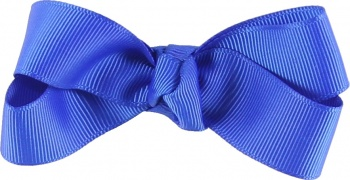 Simply Blue Grosgrain boutique style bow will match any of your outfits. This is simplicity at it's best. This is 7/8 inch wide, double loops, and a French knot in the center on an alligator clip. This bow is great for smaller heads, a small side ponytail, or for those who just like a smaller bow. This bow is in the 411 series so it can also slide right into the larger base bows that have a flat center, so look for that option too. Putting this bow on top of any other color will help to change the whole look of it.